Just days before the birth of his son, writer and theologian John Hull went blind. Desperate to make sense of a world that was rapidly evaporating, he filled hundreds of cassettes with daily musings on life, loss and love. These lay abandoned in his office for almost a quarter of a century, stacked from the ceiling to the floor, until James Spinney and Peter Middleton decided to turn them into a film. Notes on Blindness is the stunning result. Shining a light in the darkness, it blurs the lines between drama and documentary and delves into the heart of what it means to see and be seen. I sat down with the duo to talk about paradoxical gifts, memory, and the challenge of making the invisible visible. The making of the film has been an extensive journey for you both. When did you first decide to tell John's story through film? Peter: About five years ago, James and I were researching first person testimonies on sight loss and came across John’s book Touching the Rock, which is essentially a collection of diary entries he kept between 1983 and 1986, documenting his adjustment to blindness. We found these incredibly compelling, so we reached out. Within six months John sent us the original diary tapes and a box of c90 cassettes that hadn’t been played for nearly twenty five years. They’d been gathering dust. So, no one else had access to the tapes apart from immediate family? P: Even immediate family didn’t access them, really. John started the diaries as a sort of catharsis. He felt that if he didn’t try to probe blindness it would destroy him, and he didn’t want to burden his family with this pain. They were records of very private acts, and no one had listened in since they’d been transcribed for the publication of the book. How has his wife, Marilyn reacted to the film? There are some really vivid depictions of John's internal world. Did these allow her to access parts of her husband she may not have seen before? James: Absolutely. John and Marilyn were incredibly supportive and open. They described the process as reopening a thirty year-old wound. They were newly married when John started keeping the diary. For Marilyn now, there’s an additional layer of complexity. John sadly died during the second week of filming, so it's a tribute to him. We always saw the project as a collaboration, and our interviews (with them) were a joint act of remembrance. P: It was very difficult, because as well as denying Dan's voice (Skinner, who plays John) we were also denying him his eyes. He lost all of his key faculties, in a way. But when we auditioned him he excelled at lip-synching, and he had this wondrous facial furnishing, that reminded us a lot of John's beard. We sent him audio, and instead of rehearsing he'd just play it over and over again to familiarise himself with the cadence of the voices. Then, on set, a playback engineer would count him in. J: I love how grandiose the term playback engineer sounds. J: On a surface level, blindness is one of the easiest things to imitate, because you can just close your eyes. But actually, it took John several years to stop himself from having a sighted person’s brain, to truly "become" blind. It was partly a neurological re-wiring over time, but it was also a conscious decision to no longer live in what he called the nostalgia of the visual world. What he initially saw as a loss became a simple process of change and, eventually, a paradoxical gift. I was really intrigued in how that manifested for John, actually. Like when he stops smiling because he can't see if his smiles are being returned, and feels suddenly exposed and conscious. J: Through the process of grieving his sighted life, John starts conceptualising what sighted experience is in itself. He loses eye contact, intimate glances, and smiles, but the account looks both ways. Back at what he has lost, and forwards to what he has yet to discover. P: His dreaming life was also so compelling. John continued dreaming after losing his sight and his mind had an incredibly active dreaming life. He dreamt of seeing his children’s faces, of being dragged down to the depths of the ocean, of biblical rain and floods... so we had this huge range of cinematic, vivid material to draw from and visualise. The film is designed as an entry-point to his story. 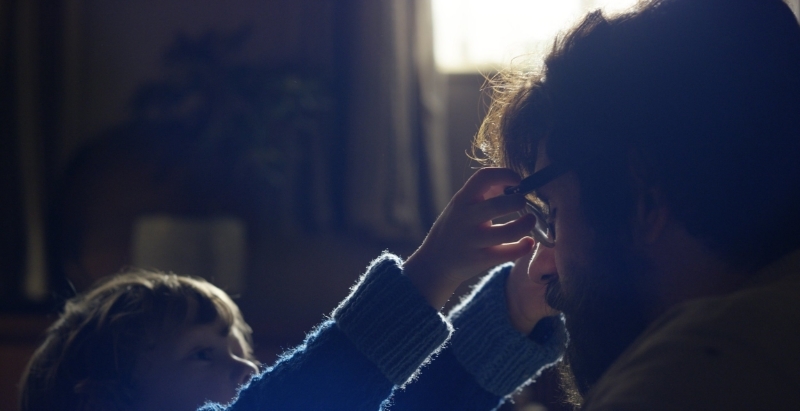 Notes on Blindness is currently in UK cinemas nationwide. Several screenings will also feature a Virtual Reality experience that delves deeper into John's internal world.